When planning an outdoor display, one of the main things to consider is the great British weather. When thinking of those long hot summer days with strawberries and ice cream, we must also think of those windy days and the odd downpour of rain. Another consideration is what sort of impact will your display make? Whether you are attending a trade fair, exhibition or any outdoor event that you may wish to use as an advertising platform, it is important that the transportation of your outdoor display does not cause a problem. You may need to choose a lightweight display that packs flat for transporting and is assembled and dismantled quickly and easily. There are many types of outdoor displays in the marketplace. One of our favourites is our popular event flag range which consists of 3 shapes. We supply feather flags, teardrop flags and sail flags which are available in a range of sizes. Used at events such as exhibitions, fairs, fates, trade shows and sporting events. Event flags come with a pole, printed graphic, a FREE carry bag and a choice of bases at no extra cost. In order to make your shop with us effortless, we have introduced our simple three-step ordering process. Simply pick your desired flag shape, pick which size is most suitable for your needs and pick your desired base - without the worry of a rise in cost. If you are unsure of which base is most suitable for your event, see our flag base guide for assistance. We do also offer a FREE artwork checking service, this will ensure that your design is checked thoroughly before being printed. 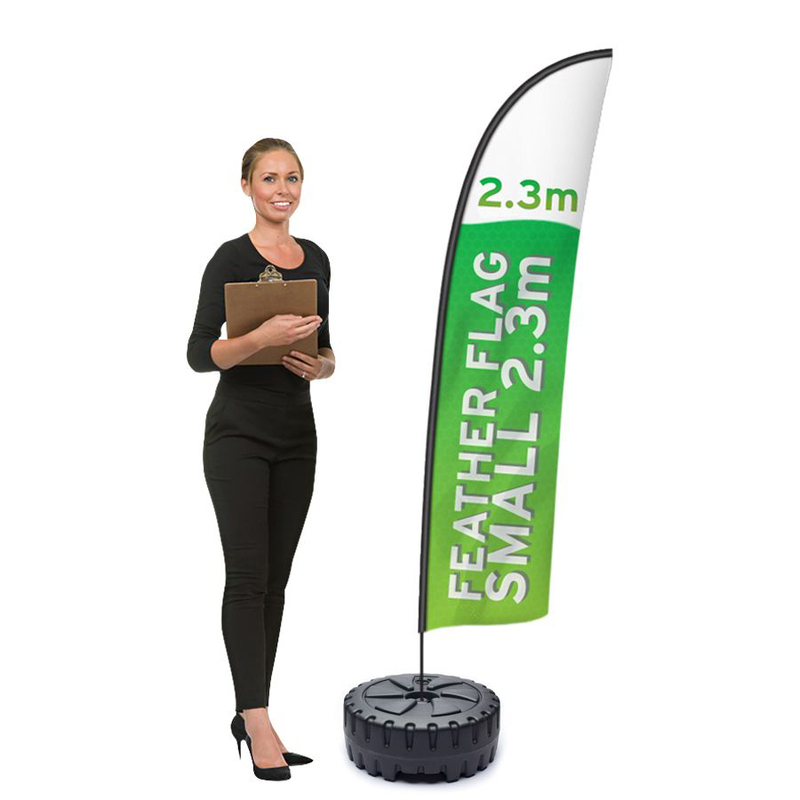 Our most popular flag is our Feather flag as they are the perfect solution for indoor or outdoor advertising. Our pavement sign range has always been extremely popular as they are so versatile and can be used in a wide range of locations. They are most commonly used outside cafes, down highstreets to enlarge footfall, retail shops and petrol stations. We offer double-sided advertising to help maximise your brand awareness from a larger range of angles. Our Booster A-frame pavement sign is great for business who wish to keep a strong branded presence outside their business as the logo at the top acts as a more permanent fixture whilst the double-sided posters can be changed at any time. Alternatively, if you change your marketing message regularly, our wooden chalkboard may be more cost effective solution as it features easy clean surfaces. Simply wipe clean and rewrite your marketing message any time you wish. Pavement signs offer quick and easy poster changes for quick and efficient marketing. Specially designed for outdoor use, our outdoor banner range are waterproof, weather resistant and are therefore great to use no matter what the weather throws at you. Once weighted down with either sand, water or heavy duty pegs, you can ensure these banner stands are stable against high winds. We offer a wide range of different shapes and sizes, whether it be horizontal or vertical banners you desire. These are available within 3-5 working days, making them perfect for those last minute events you attend. You are also able to choose between single and double sided, allowing for the option of maximum brand awareness. If you require maximum brand exposure, then there is no better product than our X-GLOO inflatable event tent. The X-GLOO is an impressive inflatable event tent and is perfect for any company looking to take their brand to the next level. The unique block building system allows you to create almost any design by adding multiple sections such as walls, canopies or X-GLOO inflatable event tents together. 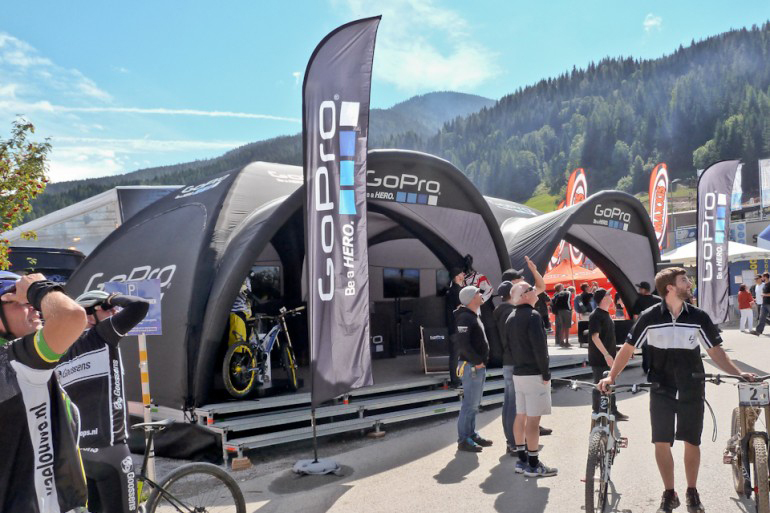 Almost every surface of the X-GLOO tent and accessories can be customised for your brand. There are so many X-GLOO accessories available, allowing for your exhibition stand to be completely personalised and suitable for a wide variety of events. With the X-GLOO inflating effortlessly in minutes with the optional electric pump the X-GLOO event tent is the perfect solution for event marketing. Available in 5 sizes - 3x3, 4x4, 5x5, 6x6 and 8x8. This allows you to carefully decide which is most appropriate for your event, especially if you are limited to a certain ground space. Our printed gazebo range is the perfect outdoor exhibition solution. We offer a range of kits including printed canopies, back walls, half side walls and full side walls. A great solution to maximise your presence at events is to pick our printed gazebo with side panels. This ensures your brand image can be seen a full 360 degrees around your stand. With unpredictable weather never far away, these printed canopies will ensure you and your visitors stay dry whilst also providing some shelter on those warmer days. If you do require a slightly different alternative or can't find the right printed gazebo for you, we do offer to help create a bespoke tent, to match your requirements perfectly. When deciding on the graphics for your outdoor display choose those that are the most appealing, good to look at and conveys your message instantly. For more information on our outdoor displays contact us or call us on 01733 511030.